For removing volatile gases and odours from air streams. Ideal when concentrations are low, and the air volume is relatively large, using activated carbon. Different grades of carbon from different manufacturers are available depending on the application. Our carbon suppliers provide comprehensive technical data and advice on the correct selection of carbon. Carbon impregnated with caustic compounds can be used to improve removal efficiencies for compounds such as hydrogen sulphide. Inbuilt fans complete with acoustic attenuation available. Design flexibility allows for units to be upflow, downflow or crossflow depending on the project requirements. Some designs use a downflow and upflow bed within the same shell to minimise floor space. Life of carbon is dependent on the quantity of volatiles being adsorbed and the mass of carbon installed. They are particularly useful for removing compounds that are not water soluble and so can’t be removed by a wet scrubber. 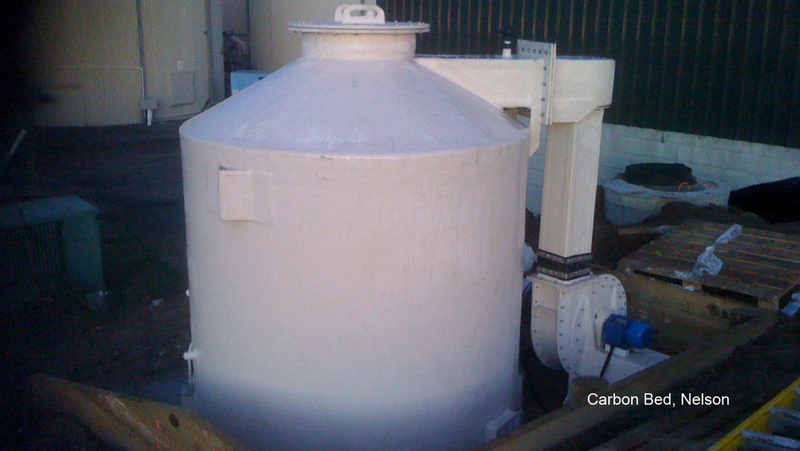 Units are designed for easy removal and replacement of carbon. Standard shell design provided for pressure range of vacuum -150mm WC to +250mm WC. Adsorber shells are constructed in corrosion resistant fibreglass for long low maintenance life when used for handling corrosive air streams.